Today I’m sharing a frozen drink recipe. 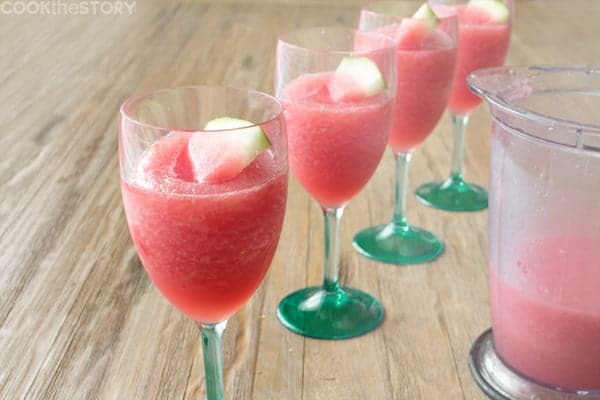 A *pink* frozen drink recipe. With lemon in it. And watermelon. And wine. 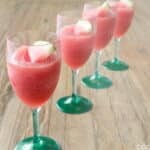 It’s a watermelon and lemon white wine slush recipe that is easy to make and deliciously refreshing. Sometimes I’m in the mood for pink lemonade. Sometimes I’m in the mood for wine. And sometimes I’m in the mood for both. That’s how I decided to try developing a wine slush recipe pinkened with watermelon and jazzed up with lemon. This wine slush recipe is super easy to make. Cut and freeze some watermelon and chill some white wine. Put them in the blender with some lemon juice and sugar and whiz it up. Then keep it in your fridge until you’re in the mood to add some to a half glass of white wine to give it some extra chill and pretty pink flavor. Oh, and if the whole idea of frozen treats with wine sounds up your alley, you should also check out my frozen watermelon white wine dessert recipe. Make a batch of this wine slush recipe and have yourself an icy, cool frozen cocktail tonight. 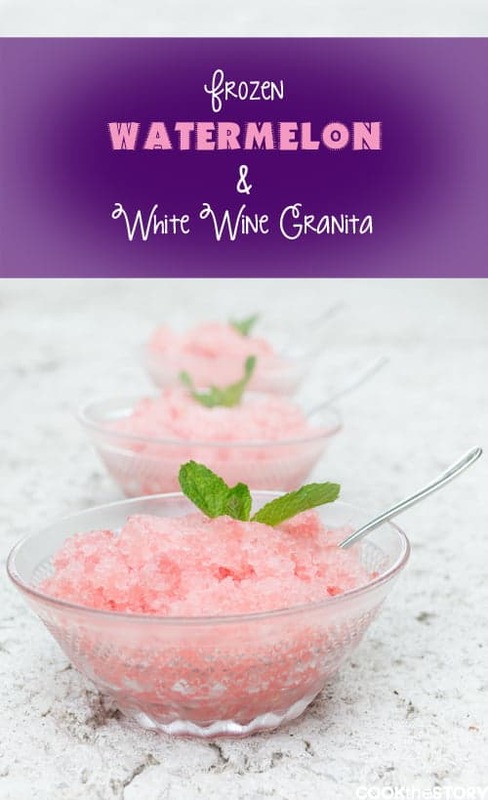 This is such an easy wine slush recipe to make. 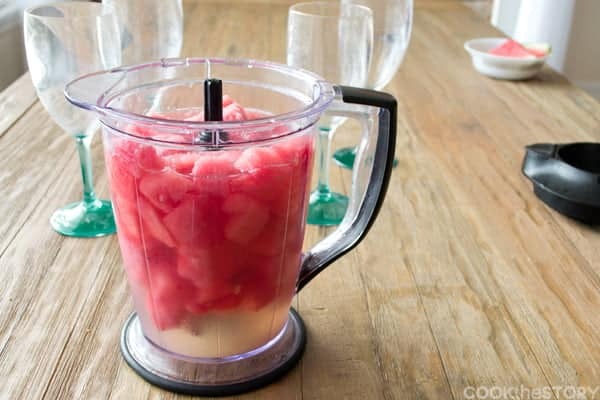 You freeze watermelon an hten put it in a blender with lemon juice and wine. Pop it back into the freezer for a bit and then to serve, spoon it into a glass and top with more white wine. Ta da! Put the watermelon, the lemon juice, the sugar and the cold white wine into a blender and whiz it around until it is smooth. Pour the mixture back into the plastic bag and back into the freezer. Leave it there until it is good and frozen squishing it now and then, at least 3 hours. Transfer the frozen mixture into a wine glass filling it 2/3 full. Top with a bit more wine. Some of my foodie friends made a wine slush recipe for you to try, too! This looks like an incredibly yummy recipe, too bad summer grilling season is over, it would be perfect. Will definitely make in future. Love this! Like a margarita, but without the tequila headache the following day! I would totally make this! Andrea, No tequila headache here! It’s true. This is as refreshing as a frozen margarita but not nearly as boozy. You can also use soda water in the last step instead of adding more wine if you want it to have even less alcohol. This would be so so so good with either a riesling or moscato. I love watermelon and wine, duh. What a good refreshing summer drink idea! What a fantastic way to keep cool on a hot summer night…such a beautiful color, too! Talk about a refreshing and tantalizing drink! Oh! This just made me want to see you even more. This drink sounds very refreshing, perfect for summer! 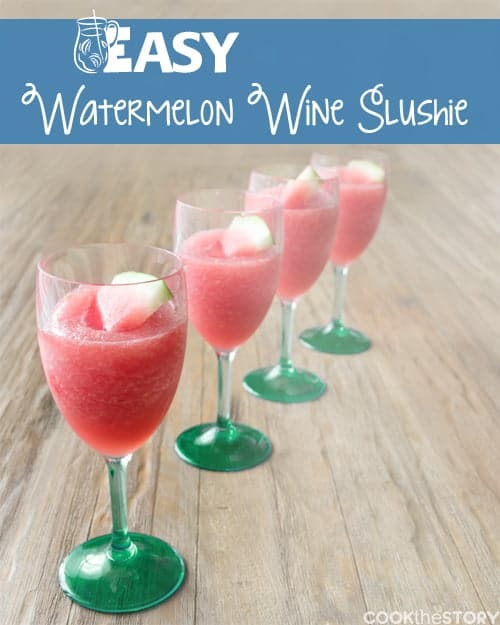 I love that this uses watermelon which is something I could exist on during the summer! I have never tried watermelon, lemon and wine together….I guess I’ll have to make it my homework!